Sign up for Broadjam today to follow Kristin Dare, and be notified when they upload new stuff or update their news! 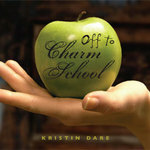 Off to Charm School is Kristin Dare's second independent release. Kristin offers powerful vocals coupled with emotional lyrics that are both introspective and whimsical. The music and production rock, telling the story of each song with just the right amount of intensity. Listen to the whole record, and enjoy the ride. You don't know what you've got until I'm gone. I've been racking my brain. To make me irresistible to you. When I'm just a glass you look right through. That seems to be the way it is. That seems to be my lot in life. I might as well turn and face the fact that I was wrong. Cause you won't see me til I'm gone. So tell me what am I supposed to think? And in you're walking with my drink. I don't know what book you're reading. It seems to be my lot in life. I might as well turn and face the fact and lose the fiction. "Nothing is as I had dreamed it'd be." And I found what I was searching for. Til I'm running for the exit door. Brave New World with eyes wide open. Nothing is as I had dreamed it'd be. And I can't go back to sleep. Before I jump into the fire. My makeup, and my shiny toys. Where I'll learn to play with all the boys. I'm gonna think a little harder. This song is about deciding not to try to be anything other that what you are. Looking at all my imperfection. I can't seem to win. When did I ask for a competition? But I think I'll go my way. Even if the odds are fading. leaning on you so far. wishin' on my own star. living inside my heart's desire. even if I'm only dreaming. that longs to be where you are. I feel a little crazy. Time to throw away stuff, And to rearrange. But there's so much I can't see. I will step out on faith. And let God sort out the rest. And lead me through the door. Stop and count to ten. Get up, and start again. And I don't know where I'll end up. And there are no guarantees. But I will follow my heart. And that's the best place to be. We are so consumed with our appearance and image that we aren't paying attention to what 's happening in the world. Cause I'm looking at myself. No, I don't want to cry. Watching you work so hard to figure me out. Hear me so there isn't any doubt. And I won't let you down. And I won't turn around. I tell ya, it's so easy. Oh, no, I'm not difficult. I'm just trying to make it easier on you. You found someone to tell you all the truth. All your love and all your money. That's just the first step, honey. You best go find someone else. One has had enough. Her heart has changed. I will answer every time you call. I will reach out every time you fall. And I'll let you think you ended this. I'll let you think you don't need a thing. And you'll go your way one up on me. Cause that's what you need to believe. That's what you need to believe. You will swallow your pride one day. And you will want me back, like in old ways. That I don't feel the same. No, I don't feel the same anymore. I'll let you think you ended this. And get so bad In the same week. Still I play the game. I want so much to please you. This is scarier than anything I've been through yet. This is crazier than all of my PMS. I am numb inside, no fragrance no emotion. I can't even seem to well up the devotion. But I can choose my life and I chose to be with you. So I won't dwell too long on what I'm going through. (Cause) I don't feel like anything, anything at all. Maybe I should just consider this a blessing. Take a break from all the drama and confessing. I should use this time to gather my momentum. I can spill it out next time I throw a tantrum. I should revel in what I can't feel inside. But I think that I will find a place to hide. I don't feel like anything, anything at all. I'm gonna sit this one out. I'm gonna wait this one out.